I want to introduce you to one of the mainstays in my store of medicinal products. If you are not familiar with tea tree oil, it is also known as melaleuca oil, and is an essential oil extracted from the leaves of a plant found in New South Wales, Australia. The indigenous people of eastern Australia have used this natural and traditional medicine to treat coughs and colds (by inhaling the oils from the crushed leaves). They also sprinkle leaves on wounds, making a poultice, and soak the leaves in water, making an infusion to treat sore throats or skin ailments. It has been around for nearly a century, and has been scientifically researched only recently. I have found it to have beneficial effects when applied topically to cuts, cold sores, insect bites, etc. I have a tendency to develop springtime allergies to blooming trees, which results at the outset, in earaches and painful sores on the sides of my tongue. I have tried all forms of relief..... rinsing with mouthwash, hydrogen peroxide, etc. I have found that the best way to soothe the swelling and the pain is to apply a topical layer of tea tree oil with a Q-tip. Within 24 hours the condition is gone. Recent studies have shown that the topical application of tea tree oil has been effective against bacteria, viruses, fungal infections, mites and even head lice. Acne sufferers have reported success with its use, and with less side effects than other treatments. It can be used to treat dandruff, yeast infections, cold sores and shingles. I MUST STRESS THAT USE SHOULD BE RESTRICTED TO TOPICAL APPLICATIONS. 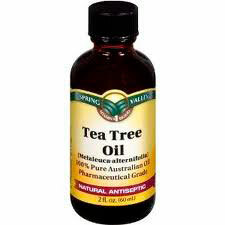 When swallowed, tea tree oil is toxic, so be sure and keep away from pets and children. But I like the fact that it is a natural product, with a long shelf life, and it has many uses. You don't need much to apply it topically, so a two-ounce bottle will last you a long time. If confronted with an emergency that restricts your access to doctors or hospitals, this natural product could be a valuable part of your medicine cabinet. You can buy it under the Spring Valley brand at Walmart, and it costs you about $8 for a two-ounce bottle. Stock up now and let me know of your success stories with tea tree oil! Jeremiah 33:6 "Nevertheless, I will bring health and healing to it; I will heal my people and will let them enjoy abundant peace and security." Thank you for this great info, I am slowly working on my medical supplies/first aid kit, so very helpful. Isn't it amazing how there is so much info out there? And every little piece we can pass on to each other is worth it. I welcome all suggestions!